President Donald Trump speaks during his meeting with Chinese Vice Premier Liu He in the Oval Office of the White House in Washington, Friday, Feb. 22, 2019. U.S. intelligence officials are increasingly doubtful that North Korean leader Kim Jong Un intends to dismantle his nuclear program, the officials told NBC News. That's President Donald Trump goal in negotiating with North Korea, though there's no evidence Kim shares it. The White House has set low expectations for the meeting between Trump and Kim this week in Vietnam. Trump could establish bare-bones diplomatic outposts between the two nations or perhaps offer to formally end the decades-old war on the Korean Peninsula, current and former U.S. officials say. 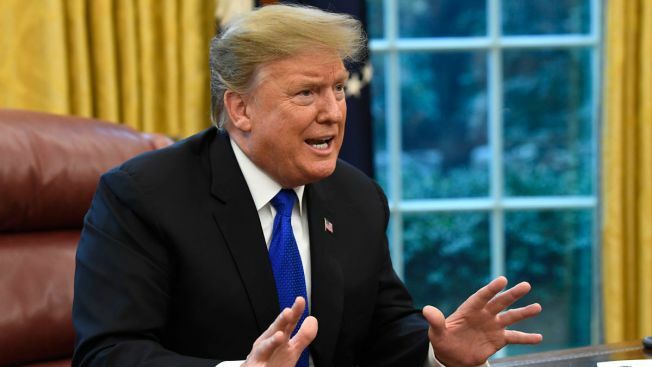 Trump has been vague on whether he would offer to withdraw U.S. troops as part of a deal, saying last week that it was "not one of the things on the table" but later that "everything is on the table." 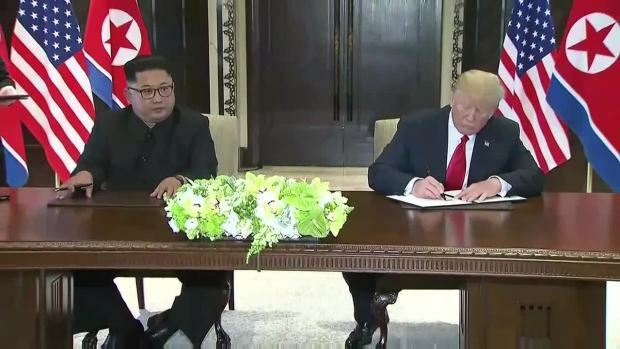 One former senior U.S. official said, "One of the worst possible outcomes is he makes some crazy deal pledging to withdraw U.S. troops for a vague promise of denuclearization."